From now on, you will receive a discount on your service and support fees if you extend the service during the ongoing service period. This is how it works: Since 2017-01-01 you receive a COUPON code on your bill for your next purchase of service extension. This voucher reduces your costs for the next service renewal of the same license by 10%. The COUPON code is valid for the respective license from the issue of the invoice until the day on which your existing service expires. The date of the last validity is displayed in the COUPON. Extend your existing service by at least 6 months. In checkout, the option "ADD COUPON" will be offered. Enter the individual coupon code for this license. You will automatically receive a discount of 10%. The new service is automatically added to the end of the current service period. The invoice now contains a new COUPON code in order to receive a 10% discount for the next renewal. Hint: You can spare yourself the manual entry of the voucher code by signing up for a subscription, which automatically extends the service in time. You then receive the discount without entering a COPUON code. With activated service subscription your service will be prolonged automatically for 6 month 30 days before it expires without any notification to do it manually. The prolongation will be charged to your credit card, its details are stored for this use at our acquirer „Heidelpay“. You will receive an order confirmation and invoice for a successful service prolongation as usual. Service prolongation via service subscription comes automatically with 10% discount. How to setup a Service Subscription? Select top menu option „Service Status"
Select your payment method or create a new one. Your next automatic prolongation will be shown at „Next Payment“. A service subscription can be created and removed at any time before a service gets inactive. What happens if an automatic service prolongation fails? If payment fails we will keep retrying. After certain fail we will deactivate the service subscription and inform you by email. Your Service Status will be set to manual mode and you will receive the known „Service Notification“. Reasons for failed payments can be expired validity, insufficient covering of payment amount or general deactivation of your credit card. If possible we will inform you about reason of rejection. Your CC details are exclusively stored on servers of our acquierer. These servers are regularly monitored by the CC-companies. One easyDCP software license can be installed only on one computer system. easyDCP Resolve Plug-In customers can get additional important informations for migration here. After the migration is complete you can generate a new license for the new ware system. Please refer to the following FAQ on how to activate your product. How to activate my easyDCP product? You find a video tutorial easyDCP Creator from V2.2 & easyDCP Player from V2.0 - Software Activation Tutorial here. There is a limit of one automatic migration in six months.  If you require a second migration within the six months period, please inform us via email why it´s necassary. Since server certificates are tied to the system hash, they become inaccessible after a migration. New certificates will be automatically created, but all KDMs issued to the old cerificates will no longer be accessible. Please check our FAQ: Server- and Signer- Certificates. Migration with older Versions: For version easyDCP Creator(+)2.1.X and older, easyDCP Player(+)1.9.X and older, and easyDCP KDM Generator(+)1.47 and older, be prepared to use the new hashcode of your target hardware/software. What is the "Reactivation Fee"? The Reactivation Fee is charged when your service has expired for longer than 30 days. The cost of reactivation is based on the period without service (full months) and 50% of the usual service fee for each license. What is the price/Where can I get the easyDCP Analyzer? The easyDCP Analyzer is not a product. Unfortunately there is no demo version available. Quality and kind of hard disk are not important but it is recommended to use a powerful interface, e.g. eSATA or USB 3.0. Commonly, carriers from the CruDataPort series are used. The file-systeme is very important. According to DCI specification EXT2 or EXT3 is required. These file systems are supported natively by LINUX. Third party drivers/emulations are available for MAC and Windows, but we know from some customers that they had problems with the Windows drivers. It is recommended to install a LINUX system either on a remote or virtual system and have it share the mounted DCP via SAMBA. The time it takes to copy a DCP onto a mobile hard-drive depends on the DCPs size and on the bandwidth. A 90-minute DCP can take up to 200 GB. It is highly recommend to verify the DCPs integrity. To do that, you can start the DCP validation (included in easyDCP Creator+ and easyDCP Player+) and run a Hash-check (e.g. with MD5) of the DCP before copying to the hard disc. After copying run the Hash-check again. The results of the hash-check must be identical otherwise the DCP may crash. This extra work is in no relation to later exchange of the DCP in the cinema. Copying needs to be done independently from the easyDCP application, e.g. with Finder or Windows Explorer. Also professional mass-duplication software is available and convinient for larger copy batch jobs. Additional hint: Using of Digital Cinema Naming Convention is higly recommend to ease the workflow in the cinema server. Create correct syntax of Digital Cinema Naming Convention is embedded in easyDCP applications. bugfix: some IMF packages could not be opened, because the the MXF essence coding label's version byte was not ignored. At the time the above frame-rates are DCI-compliant and should be process able by today´s cinema playback systems. If you need higher frame-rates for experimental purposes, please contact us at info@easyDCP.com. How can I apply for a facility code? Why is my facility code not available in easyDCP? You may apply for a facility code at http://www.digitalcinemanamingconvention.com . Select menu-entry "Edit with Digital Naming Convention"
The added facility code is now part of the Facility List and can be used for CPL naming. How can I create a DCP with Closed Captions? Closed Captions are timed texts that are intended for hearing impaired audience members. Captions usually include the dialog and descriptions of sounds ("phone rings", "door slams" etc.). "Closed" means that the captions are off-screen and not visible to the entire audience. On the other hand, "open" or "burned-in" means that the captions are on-screen and visible to all viewers. You can add up to 16 Closed Captions per reel. Please make sure that all referenced subtitle assets like fonts (.ttf, .otf) or images (.png) are available, otherwise package generation will fail. Please note: The DaVinci Resolve easyDCP Plugin does not yet support captions. Customers who own an easyDCP standalone license for easyDCP can receive and use a legacy licenses for previous easyDCP releases free-of-charge on the same hardware. You will find the option "Other releases" in your license status. You must have a version 2.0 or higher licensed. The legacy license can only be used on same hardware as the easyDCP standalone licenses are issued to. Only previous easyDCP versions can be requested. Open your license status and click on "Other releases" and download the desired version. If it's a recent release of the current easyDCP major release (eg 3.5.5 > 3.5.X), you can continue to use your current license. Download and install the license file as usual. If you switch to a version before the current easyDCP major release (eg 3.5.5> 3.4.X), you must activate this easyDCP application. Start the activation and if you meet the requirements (the current easyDCP version is activated on the same hardware), the webshop will offer you an old version license. Download and install the license file as usual. You can find more information on how you can activate your Application in our FAQs: How do I activate my easyDCP Product? I do not need to generate/playback stereoscopic 3D or encrypted DCPs for now, but I might in the future. Can I buy easyDCP Creator/easyDCP Player now and upgrade later? Yes, you can upgrade to a easyDCP "+" edition or upgrade to easyDCP Bundle1 or easyDCP Bundle2 later. Precondition is your up to date easyDCP application with valid service extension. Please note: Stereoscopic 3D DCPs can also be generated and paid on a project basis with the easyDCP Publisher. I have an existing DCP. Can I open and edit the DCP in easyDCP? The easyDCP Creator can open, edit and regenerate unencrypted DCPs. Changes to the metadata can be applied within seconds using the "Save Package" function, without time-consuming new image and sound data generation. The easyDCP Player+ can open unencrypted and encrypted DCPs, unpack and export them to j2c / dpx / tif / wav formats. If desired, an easyDCP project file (.dcpproj) will be created automatically to load the unpacked DCP later in easyDCP Creator or easyDCP Creator+, in which all metadata is supported. Subtitles or other language versions can be added directly here, but other changes can also be made, including re-encryption. The easyDCP Resolve Plugin can be used to load unencrypted and encrypted DCPs as well. Please note: The easyDCP Publisher does not support the opening of packages yet. I have an existing DCP. How can I make changes or create a Supplemental DCP? With easyDCP Creator 2.0 or newer, you can load a DCP using the "Open DCP" option in the "File" menu. Once loaded into easyDCP Creator, you can add subtitles, add a new composition or modify an existing one, change the names, etc. Provided you have not changed the essence, but only metadata, you do not even have to re-generate the DCP, but instead just overwrite the existing XML-based metadata files by clicking "Save DCP". Similarly, you can enhance the loaded DCP by generating a Supplemental DCP. To do that, just right-click the loaded track files and mark them to be used as references. Referenced track files will not be included in the new package. After importing new track files and assembling a new composition, generate a new DCP. Only the new track files will be included in the generated DCP and therefore it cannot be played by itself. However, when you ingest both the original and the supplemental DCP into a cinema server, the server will resolve the referenced track files of the Supplemental DCP (VF) against the original DCP (OV). The conversion of DPX or TIFF sequences (as well as many other video formats) is one of the basic functionalities of easyDCP Creator and easyDCP Creator+. In order to outsource the time consuming conversion to another workstation or to operate in parallel, each version of easyDCP Creator+ contains a free single version of easyDCP JPEG 2000 Transcoder. Additional licenses can be purchased on demand. easyDCP Creator and easyDCP Creator+ can render SMPTE- as well as Interop- compliant DCPs. When you start a new project, just pick the project type and whether you want Interop or SMPTE conformity. easyDCP Creator allows to encode unencrypted 2D DCPs (2k or 4k). easyDCP Creator+ additionally enables 3D DCPs as well as mastering of encrypted digital cinema content. Support for creating IMF packages as also a feature exclusive to easyDCP Creator. Playback of digital cinema content, so-called DCPs (Digital Cinema Packages), requires standardized encoded image-files packed in a standardized container. These standards are specified by the SMPTE and - for transitional use – in certain Interop-specifications. easyDCP Creator and easyDCP Creator+ enable the production of SMPTE- as well as Interop-compliant DCPs (Digital Cinema Packages) easyDCP Creator allows to encode unencrypted 2D DCPs. easyDCP Creator+ additionally enables 3D as well as mastering of encrypted digital cinema content. To optimize workflows in postproduction it can be useful to work with color transformed and compressed JPEG2000 files from an early phase on. This makes it easier to transport files to another location for further processing or to accelerate the transfer from one storage-device to another. easyDCP Creator, easyDCP Creator+ or the easyDCP JPEG2000 Transcoder enable the production of SMPTE or Interop compliant JPEG2000 files. easyDCP JPEG2000 Transcoder in particular is a low priced option to work with prepared and standardized JPEG2000 picture sequences long before the mastering of a DCP. What are Compositions and Reels? Will the cinema operator be able to enable or disable subtitles? A DCP contains one or more compositions. Each composition consists of one or more reels that will be played one after another. Each reel has at least a picture an a sound track file. Optionally, it also contains a subtitel track file. A reel´s track files must all have the same duration. In easyDCP Creator, you can edit in-and out-points by right-clicking a track file that you already dragged onto a reel. This way you can skip a run-in or sync your audio and video track files. Keep ini mind that an Interop subtitle must not contain any time stamps beyond the reel´s duration. Time stamps are relative to the reel´s first visible frame.  A single track file can be refrenced from multiple reels of the same composition. This way it is easily possible to skip a scene or title by setting the track file´s instances´ in- and out-points accordingly. An exemplary use of multiple compositions would be, if you wanted to distribute a movie in multiple languages. For each compositon you would use identical picture track files, but language-specific auto track files. Compositions will not be played one after another. Instead, the cinema operator will choose which composition to play. Don´t forget to edit the composition´s names or otherwise the cinema operator might not find it on the server. Hint: You can right-click the title and open an editor to compose a title according to the rules of the Digital Cinema Naming Converions. When I create a DCP from a QuickTime movie, the DCP is a bit brighter (QuickTime-Gammashift). What can I do ? It seems with some QuickTime codecs, the gamma is slightly changed by the QuickTime framewok when frames are decoded. This is a known problem when using QuickTime. easyDCP Creator allows to compensate this QuickTime-Gamma-Shift. By default, a value of 2.2 is set for gamma of the input color space. 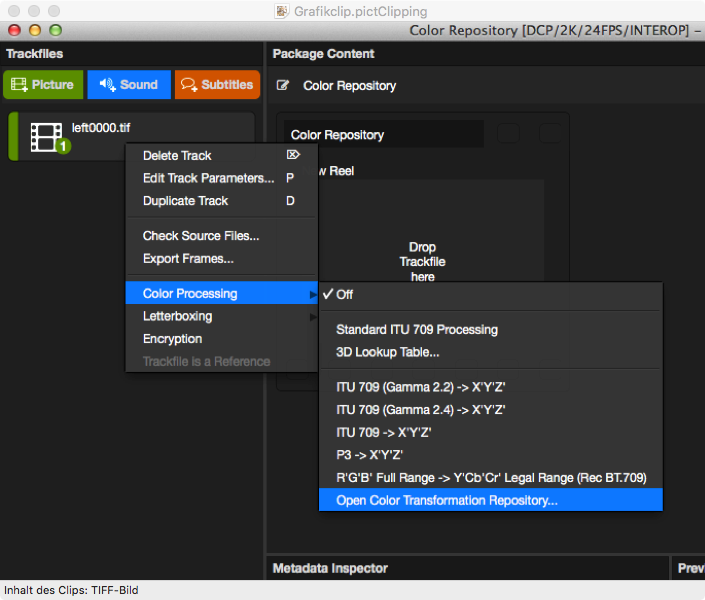 You can add additional color space transformations or adapt existing transformation settings. Open the folder containing the color transformations by right click on a Picture Track File -> "Color Processing" -> "Open Color Transformation Repository...“. Duplicate the standard XML-File for RGB -> XYZ color transformation "color_transformation_itu709_to_xyz.xml" and rename it for example to "color_transformation_itu709_to_xyz_quicktime_fix.xml"
Now you can find the adapted color transformation as new option by navigating to Picture Track File -> "Color Processing". 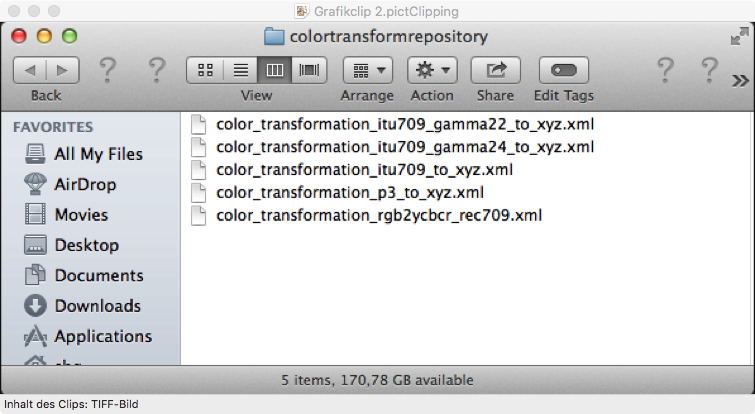 – Increase the gamma oft he Mov file´s gamma before you ingest it into easyDCP Creator. – Use DPX or TIFF still image picture sequences instead of QickTime video. When will a hardware-accelerated version of easyDCP Creator be available? CPU-accelerated encoding with CUDA®-enabled graphics card was introduced in easyDCP Creator 3.3 and easyDCP Creator+ 3.3 (Windows® only). You can now encode DCPs faster than real-time. Please note: The easyDCP JPEG 2000 Encoder also supports GPU acceleration. The easyDCP Publisher does not yet support GPU acceleration. Where can I download the easyDCP Creator manual? Where can I get the server certificates required to create the KDMs? The procedure is different in every country. We can't send you the certificates. The best way is to ask the cinema owners directly. They should have current certificates of their projection systems in their screening rooms or tell you the model and serial number. Another idea is to contact the server vendors directly. If you have the model and serial number, you can contact the manufacturer and ask for access to their database. Which system configurations do I need for the easyDCP Creator/Creator+, easyDCP JPEG 2000 Transcoder or easyDCP Publisher? easyDCP Creator/Creator+, easyDCP JPEG 2000 Transcoder and easyDCP Publisher are highly optimized for running on multi-processor/multi-core machines. On Windows, it can also use one or more CUDA® enabled graphics devices. Why can I not generate a Fraunhofer Digest file when generating DCP? Since version 2.1 of easyDCP Creator+ it is possible to open encrypted DCPs and to use these DCPs as a basis for new DCPs. There are basically two ways of providing the keys in order to allow easyDCP Creator+ to decrypt the content for the preview and before generating a new DCP. If one provides the keys by a Fraunhofer Digest, we assume that the user generated the content and that he is in charge of the source content used for the first DCP generation. In such a case you can do everything in easyDCP Creator+, including the deactivation of the encryption and the generation of a new Digest when generating a new DCP. If one provides the keys by a Distribution KDM (or KDM), easyDCP Creator+ does not allow to disable the encryption nor lets it generate the Fraunhofer Digest for the new DCP. In order to understand this behavior we have to explain that the Fraunhofer Digest stores the encryption key as plain text on the hard drive. Without disabling the Digest-option one could easily open an encrypted DCP together with a DKDM, generate a new encrypted DCP and store the encryption keys in plaintext. Since content-owners are very diligent with their content, Fraunhofer IIS decided to disable the option since version 2.1. DKDMs are used for the exchange of encrypted DCPs between postproduction houses. Processing DKDMs needs the same operation and security requirements that are used in the creation and operation of KDMs for the digital cinema. easyDCP Creator+ enables to encrypt digital cinema content and the standard accessory easyDCP KDM Generator generates KDMs and DKDMs for the transfer of digital cinema content to postproduction houses or cinemas. For automatic generating and distribution of KDMs the online service KDM Studio is available at www.dcptools.com. 1. Load the DCP or IMF package in easyDCP Creator+. Info: A reel should automatically be added to the composition (here: reel #2). Info: A reel should automatically be added to the composition (here: reel #3).